Are you a big fan of shrimp cocktail? 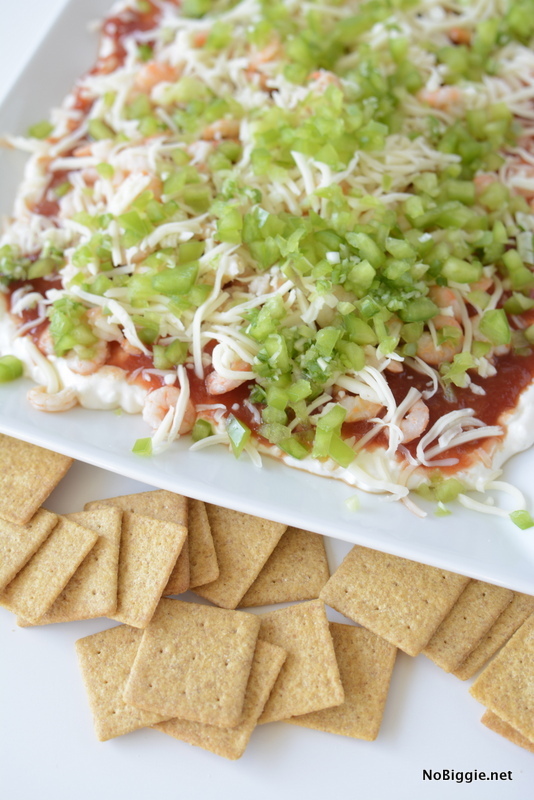 If so, you’ll love this shrimp cocktail dip! 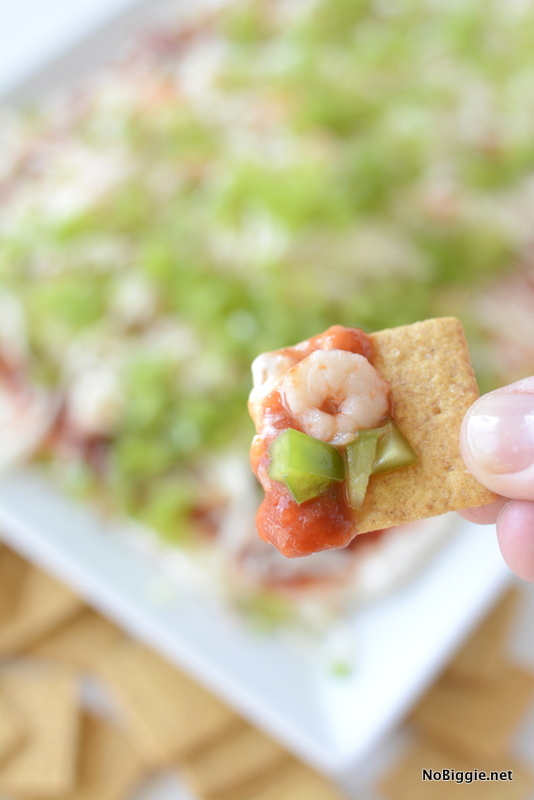 It’s one of my most favorite appetizers to bring to a party. Most of my favorite recipes come from my mom. She’s an excellent cook. I’ve been thinking about my mom a lot lately as she has been helping her parents who live in Montana. It’s been so hard to see my mom cope with the aging of her parents. One thing you can always count on with my mom, is great food. It’s something that she learned from her mom (my Grandma Kae). You should see the two of them together always planning out the next meal. We laugh about it when we are all together, but now that I really think about it, it’s their way of showing love; love for their family, love for their friends, love for the new mom who just had a baby or the neighbor who is sick. Food really is love. So this recipe today is in honor of my mom. Thank you, Mom for encouraging me in the kitchen and inspiring me to have a love to cook. Oh it’s so good! Don’t forget the wheat thin crackers! They are a must with this dip! The flavors of shrimp cocktail served in a creamy dip. 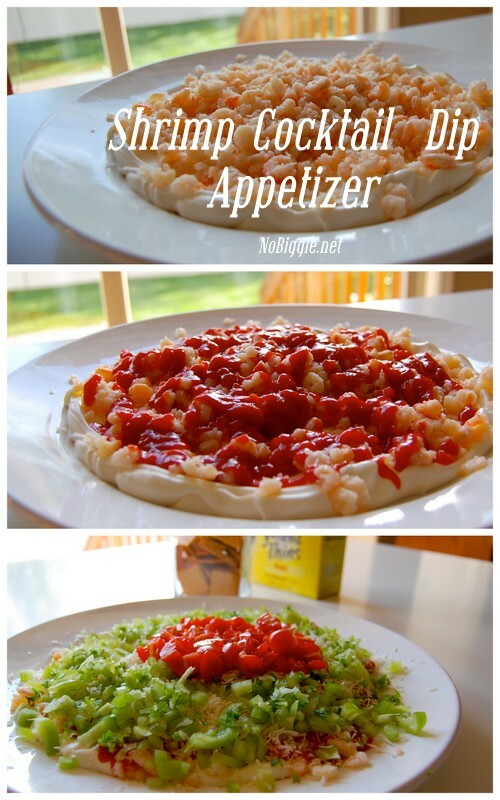 Everyone loves this party appetizer. Combine and mix together well the cream cheese, sour cream and mayo. Spread on a 12-inch round plate. Top with green pepper, green onion (chopped super fine) and tomato. 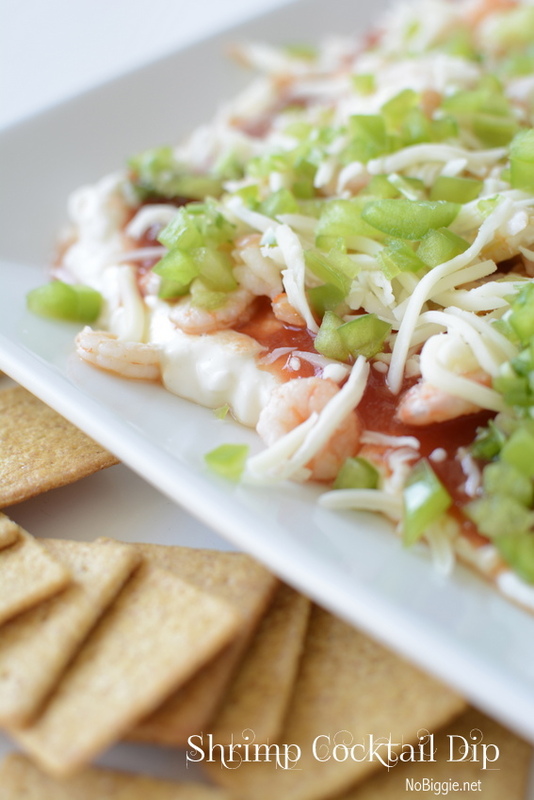 Serve chilled with wheat thin crackers. Your mom IS one of the best cooks I know. All you kids inherited that talent too. We love having Dorius/Tyler parties and look forward to the "spread" you all provide. You mom is also very kind and has a huge heart. I love your mom too! This looks fabulous. I've seen something similar. The hostess will put a block of cream cheese on a plate, then pile on some shrimp and top it with cocktail sauce. This looks so much nicer and it looks like it has much more flavor with the other added ingredients. We're hosting a get together on Friday and this is going to be the appetizer! Thanks for sharing! Thanks for the compliments, Kam! That appetizer is a keeper. I LOVE shrimp. I will definitely be making this. Thank you, Dawn. What a compliment! We do have a great mom. Love you mom! Oh, this looks and sounds delicious. Printing the recipe now–thank you! that looks very delish. thanks for the recipe, and a shot out to all our moms wooo hoo!! Addictive!!! That one is I tell you! One Christmas, Mom put the tomatoes and green peppers on top in the shape of a wreath. She never stops! Oh Yum! I am so going to make that. 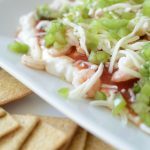 My mom always served a block of cream cheese with a bottle of cocktail sauce poured over the top, and then a can of shrimp dumped on top of that. Ugly, but delicious. Yours beats mine because its beautiful. Can't wait to try it and show my mom up! I haven't made this in years – so good – I've also done it with Louis Kemps Lobster or Crab meat.